Aren't all RV's just a little haunted? The powerhouse duo of Denis Richards and Mischa Barton discover that in the upcoming thriller The Toybox. Today, we have the trailer and poster for this hellbound ride, which drives into theaters this fall. Denise Richards and Mischa Barton battle a haunted RV In Tom Nagel's The ToyBox. The supernatural thriller opens in limited release September 14th, with a nationwide Digital and Blu-ray release coming September 18th. Skyline Entertainment and Steel House Productions are proud to announce the day and date release of Tom Nagel's The ToyBox, starring Denise Richards (The Real Housewives of Beverly Hills, Starship Troopers, The World is Not Enough) and Mischa Barton (The O.C., The Sixth Sense). Reuniting the team behind 2016's ClownTown, Nagel's supernatural thriller follows an ill-fated family on a road trip intended to bring them back together, but the possessed RV they're traveling in may destroy them all. The ToyBox will open in Los Angeles at Laemmle's NoHo 7 on September 14th for a week run. On September 18th, the film will be available nationwide on Blu-ray, DVD and Cable and Digital HD, including Amazon Instant, iTunes, iN DEMAND, DirecTV, Comcast, Optimum, Dish, Google Play and more. The ToyBox stars Denise Richards, Mischa Barton, Matt Mercer (Beyond the Gates, The Mind's Eye), Jeff Denton (NCIS, Criminal Minds), Brian Nagel (Katy Perry's Roar), Greg Violand (Batman vs Superman: Dawn of Justice) , Malika Michelle, David H. Greathouse, and Katie Keene. The ToyBox is directed by Tom Nagel from a screenplay written by Jeff Denton. Jeff Miller (Inoperable, Ouija House) and the Nagel Brothers contributed to the story. The Nagel brothers produced along with Miller (through Millman Productions) and Denton. Jim Jacobsen, Eric Brenner, and Ronnie D. Lee are executive producers. 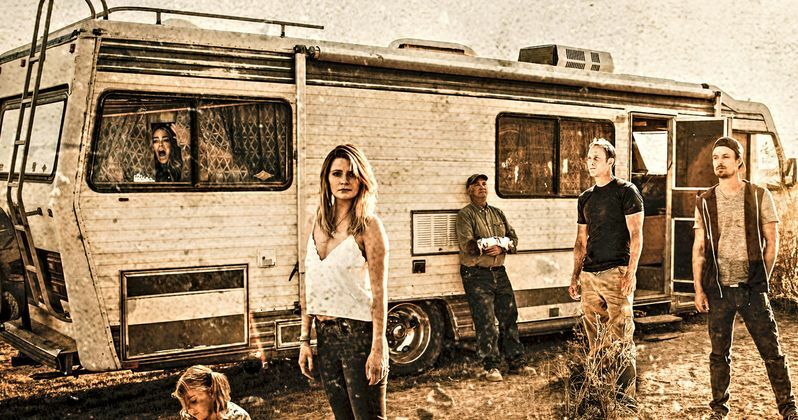 Jennifer (Richards) and her family go on a summer road trip in a used RV with her husband's estranged father and brother. Along the way, they find Samantha (Barton) and her brother, broken down on the side of the highway. After driving into the middle of nowhere, the RV takes on a mind of its own, crashing and stranding them in the scorching and isolated desert. Little by little, the unsuspecting group of travelers is blindsided by the terrible secrets within the walls of the RV and find themselves fighting to survive. The Toybox is 95 minutes of pure unrated terror. The Blu-ray and DVD releases of The ToyBox will exclusively include a feature-length commentary with director Tom Nagel, producer Jeff Miller, producer/writer/actor Jeff Denton and producer/actor Brian Nagel and a behind the scenes featurette. You can check out the first scary trailer and new poster for The Toybox. Steel House Productions really wants to terrify you and your family this fall season. So why don't you just let them?